To order over the phone call 1-(260)-255-9619 Monday through Friday 10:00 am.- 5:00 pm. Eastern Time. Item #57403 Corgi- Die-Cast Re-Issue Kojak Car $49.95 In Stock (ONLY HAVE 1) This 1999 Corgi die-cast Kojak Buick car comes with a white metal hand painted Kojak figure, car is in 1:36th. scale, both car and window box are near mint, never been opened, full color with rubber wheels. Item #57404 Corgi-Die-Cast- Return of the Saint Car $49.95 In Stock (ONLY HAVE 1) This Corgi Die-cast Return of the Saint Jaguar XJS car comes with a white metal Saint figure is near mint in a near mint never been opened window box, full color with rubber wheels, car is in 1/36th. scale. 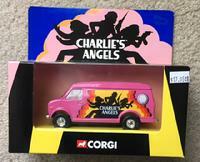 Item #87501 Corgi-Die-Cast Charlie`s Angel Van $49.95 In Stock (ONLY HAVE 1) This 2001 Corgi die-cast Charlie`s Angel van is about 4 1/2" long in full color with rubber tires, is near mint in a near mint never been opened box. Item #05501 Corgi- Die-cast Back to the Future-Delorean Time Machine Car $49.95 In Stock (ONLY HAVE 1) This 2001 Corgi Die-cast Back to the Future- Delorean car comes with a Doc Brown white metal figure, car is in 1:36th. scale full color with rubber tires, is near mint in an in-opened near mint window box, car is about 4 1/2" long. Item #00802 Corgi- Die-Cast- Fawlty Towers-Austin Car $49.95 In Stock (ONLY HAVE 1) This 2000 Die-Cast and hand painted Fawlty Towers Austin car as seen in the 70`s BBC TV series starring John Cleese and comes with a John Cleese white metal figure, car is about 3" long, comes near mint in an never been opened near mint box. Item #05601 Corgi-Die-Cast Knight Rider-KITT Car $49.95 In Stock (ONLY HAVE 1) This 2001 Die-cast Knight Rider-KITT Transam car also comes with a Michael Knight white metal hand painted figure, car is in 1:36th. scale, full color with rubber tires car is about 5" long, is near mint and comes in a near mint never been opened window box.